One of the most exciting parts of our job is seeing patterns we create translated into wonderful end products by our clients. The process of design, production, marketing and sales often takes six months to a year or more, so it’s always fun to spot the designs out in the market after having moved on to other projects. 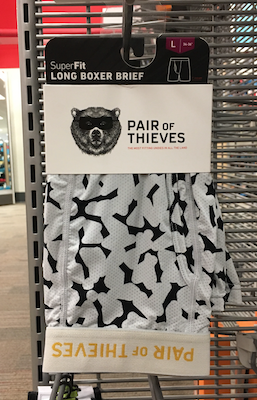 Today we’re excited to share one of the latest product sightings featuring Pattern Observer Studio patterns, these fabulous undies by Pair of Thieves! Four Pattern Observer Studio designs made it into this recent collection and we could not be more delighted by the result. They are currently out at Target stores and at pairofthieves.com. Are you in need of a custom pattern? We’ve designed hundreds of prints and patterns for clients such as Pair of Thieves, Lucy Activewear, RYU, Icebreaker, and more…and we can do the same for you. Contact our Studio Manager at chelsea@patternobserver.com to get started.